2016 marks 50 years for Glenn Green Galleries (The Gallery Wall). We are sifting through archives and finding various photos, videos and artwork. We maintain galleries in Santa Fe/Tesuque and Scottsdale, Arizona at the Phoenician Resort. The Gallery + 5 acre sculpture garden located in the village of Tesuque features outdoor installations of major sculpture in granite by Khang Pham-New, fabricated steel sculpture by Guy Dill, Rodger Jacobsen, Melanie Yazzie and Michael Kabotie as well as stone sculpture by John Reeves and bronze sculpture by Eduardo Oropeza. Glenn Green Galleries opened it’s first location in downtown Santa Fe in 1979. They moved to the Tesuque property in 1994. The original building was built in 1914. We enjoy the community of Tesuque and having the space to exhibit sculpture outdoors. Check out the video of a wonderful sculpture installation featuring Allan Houser Haozous in 1994 in our garden. Glenn and Sandy Green began representing Allan Houser in 1974. The gallery continues to present and sell Allan Houser artwork on the secondary market. Check the Allan Houser section of our website to see current works available or contact us to resell your Allan Houser artwork. 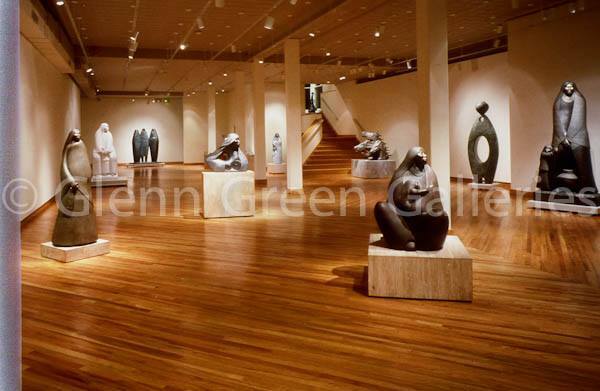 The Gallery Wall Inc dba Glenn Green Galleries opened its 14,000 Square foot gallery on the Santa Fe Plaza in 1987.